One sharp-eyed quilter alerted me to the fact of how close 'Annie sq f' was to a Shoo Fly block - so I have adapted it to fit and added it to the Annie set. The original block ha now been withdrawn - having two for the price of one seems a much better idea! The original block has now been withdrawn - having two for the price of one seems a much better idea! 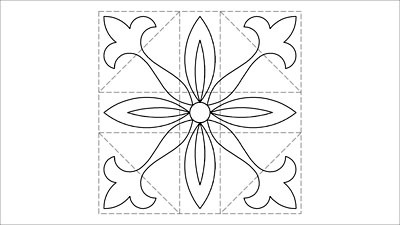 if using this in a Square in a Square block - a slightly larger margin than usual might look best and more easily fit.